ECOmove, the Danish developer of unique and innovative solutions for EVs and e-mobility, uses the Paris Motor Show to exhibit a revolutionary all-in-one wheel motor solution for EVs, where motor, brakes and suspension are all fitted into the wheel unit itself, thereby significantly reducing both weight and production costs. Today, manufacturers of electric vehicles – EVs – are often faced with two challenges: How to reduce the amount of expensive batteries in electric vehicles, and how to keep the costs at a reasonable level. ECOmove offers a solution that addresses both issues. In fact, the all-in-one wheel motor unit is probably the most efficient on the market. The ECOmove wheel motor unit is a fully functional drivetrain with motors, brakes and suspension system built in. With strict objectives of reducing the weight and the number of parts, the design team came up with an uncomplicated and compact unit, which is based on a unique suspension system in composite materials that eliminates the need for bearings and springs. This system is now patented and ready to be manufactured at low cost. With only a few parts, and a minimum of them moving, maintenance requirements are very limited. This is supported by the engine performing up to 80% of the braking, resulting in less wear on the mechanical brakes, and the fact that no oil changes are required. As an off-the-shelf solution, the wheel motor unit is mounted separately and with no axel. The unit is easily accessible and as a unique feature, it can be dismounted and replaced or maintained on-site. The modular design provides the system with a high level of flexibility and customizability. Depending on the application, the wheel unit can be configured as active or non-active on functions such as turning, braking and engine. In order to get the full potential from still rather expensive batteries, the ECOmove wheel motor unit has a very low weight. Due to the use of lightweight materials, the weight of this driveline – including motor – is the same as one of the wheels on a traditional car. 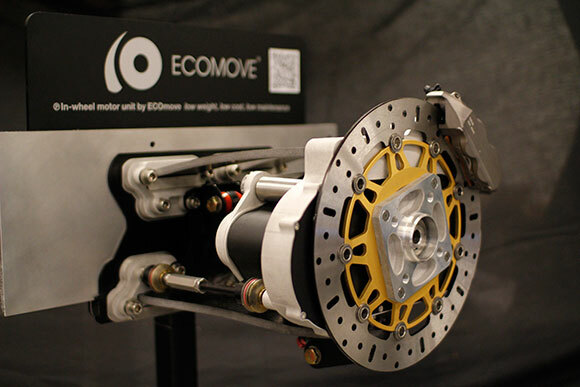 Overall, the technologies used in ECOmove’s all-in-one wheel motor unit make it possible to build vehicles that take up less space, cost less and simultaneously get longer range and better performance. – Due to its flexible construction, the ECOmove wheel motor unit can be used in many different car-designs, and it has the potential to save millions of euros for car makers – and accelerate the process of getting more electric cars on the streets worldwide. With a global car market that is estimated to double in ten to fifteen years, and with the demand for sustainable vehicles, ECOmove expects to get a share of the market. ECOmove is currently negotiating with partners, who want to implement the ECOmove wheel motor units, as well as other of the company’s lightweight components – many of which originated from the QBEAK, which is the in-house designed car of ECOmove. ECOmove was founded in the spring of 2009 by three Danish entrepreneurs, and with years of experience in designing and developing cars as the backbone – and with an investment from Insero Horsens, a Danish equity company – ECOmove initiated the work on a real electric car; a car which was built to run on electric power from the beginning. Today, ECOmove has grown into a company that possess extensive knowledge, experience, network and competences within technologies for e-mobility, and as a result of a passionate team with the capabilities to combine mechanics and electronics, the company has – over the years – developed some unique and innovative solutions for the future market of e-mobility; solutions that benefit both users and manufacturers as well as the environment. The first of these solutions is the all-in-one wheel motor unit, which is introduced at Paris Motor Show 2012. ECOmove is financed by Insero Horsens and Østjysk Innovation. Insero Horsens is a Danish association that invests in enterprises, entrepreneurs and projects within innovation, energy and communication technology. Their goal is to expand and strengthen the area between Horsens, Hedensted, Vejle and Juelsminde. Insero Horsens has, among other things, been involved in gathering an electric car cluster in eastern Jutland. Read more at www.insero.dk. Østjysk Innovation invests in the development of good ideas conceived by enterprising researchers, students, employees in private enterprises etc. The goal is to create and develop several knowledgeable enterprises with unique competencies, which have the potential to become some of the most important growth enterprises of the future. Read more at www.oei.dk.